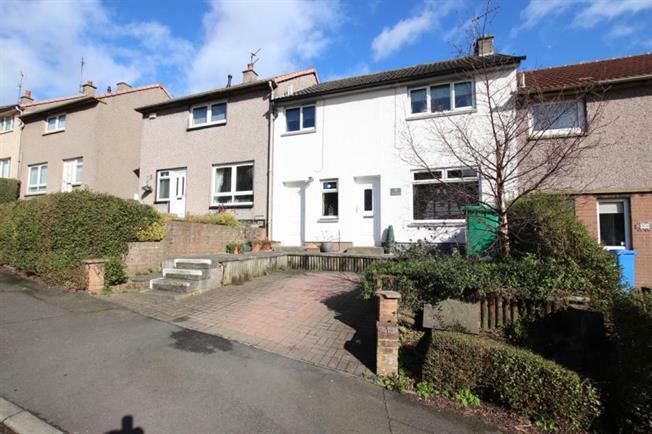 3 Bedroom Terraced House For Sale in Kirkcaldy for Offers Over £98,000. Tastefully decorated three bedroom mid terrace villa boasting an impressive plot. Dallas Drive is located a short distance from Kirkcaldy town centre which has a wide range of services and amenities including local shopping, banking and recreational facilities. Nearby road and rail networks also allow ready access to the most important business and cultural centres throughout Scotland. Internally the property comprises of welcoming entrance hallway, well proportioned lounge with gas fire and allows for lots of natural flowing light, fully fitted kitchen with a range of base and wall mounted units, complementary work surfaces, space for a dining table and a door into the rear garden, utility area which can be accessed via the front of the property or the kitchen. A staircase from the hallway grants access to the upper level which consists of master bedroom with modern integrated wardrobes, a second and third bedroom both are good sizes and a fitted three piece bathroom suite with shower over bath. To the front of the property is a mono blocked driveway which provides off street parking for multiple vehicles and to the rear is an impressive garden area with laid lawn, patio, flower beds and barbecue area. At the bottom of the garden is a purpose built out building in which the current owners utilise as additional storage however has the flexibility to be a studio or summer house. Warmth is provided by a gas fired central heating system and double glazing is installed.